In 1814, a trio of men who called themselves the "Covington Company," purchased 150 acres on the west side of the Licking River at its confluence with the Ohio River. The name was chosen in honor of their friend, General Leonard Covington, an officer who had died in the War of 1812. Their original city plat was 5 square blocks, and they intentionally lined up with the streets of Cincinnati across the Ohio River. The first five streets running north to south were named for Kentucky's first five governors: Shelby, Garrard, Greenup, Scott, and Madison. In 1815, Covington was incorporated as a town. At the time, it was part of Campbell County. Covington never could quite match Cincinnati's river town success because the river on the Kentucky side was too shallow for a viable public landing for boats and steamships. However, a wave of German immigrants in the 1830s caused the town to grow, and in 1834, the town of Covington was incorporated as a city. 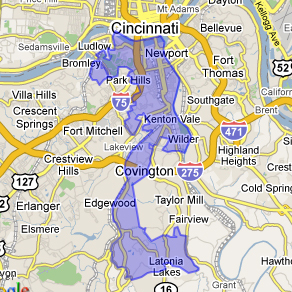 In 1840, Kenton County was formed, for which Covington is one of the two county seats. But Covington became the defacto county seat because it was a thriving urban area compared to the rural city of Independence. The courthouse was built in Covington in 1843, near the public market house and square, which was situated between 3rd and 4th Streets, and Greenup and Scott Streets. Due to the population growth, the city grew beyond its 5 blocks. Main Street was added to the West, and 12th Street to the South. These additions created the German-speaking neighborhoods now known as Mutter Gottes and Mainstrasse Historic Districts. A public market was established at Main and 6th Street in the center of the wide street. A second, and more lasting, public market sprang up at Madison Avenue and Pike Street in 1853. The Mutter Gottes Kirche (Mother of God Church) was built in 1871. Another landmark church, the Cathedral Basilica of the Assumption, began construction in 1894 and was completed in 1915. The area south of Covington grew during this time as well. The Western Baptist Education Society purchased 370 acres south of the city borders in 1841, which the city annexed down to 15th Street in 1843. The society opened the Western Baptist Theological Institute in 1845, but the campus was divided by the new tracks for the Covington and Lexington Railroad, and the society was engulfed in a dispute over slavery. These factors fueled the dissolution of the organization in 1853. St. Elizabeth Hospital operated in one of the college buildings between 1868 and 1911. In 1851, the city annexed two more largely-German neighborhoods, one referred to as Austinburg, which was approximately 80 acres along the Licking River from 16th Street to 20th Street, and another was the western neighborhood now known as Lewisburg. 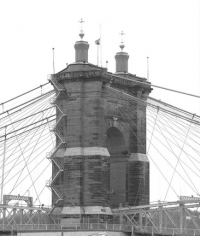 The Covington and Cincinnati Bridge Company signed John A. Roebling for the construction of the Suspension Bridge, which started in 1856. A series of halts occurred due to the Panic of 1857 and the Civil War, but the bridge formally opened in 1867, promoting further commerce between Kentucky and Ohio. The bridge was originally designed for horse cars and pedestrians, and was reconstructed in the late 1890s to accommodate electric streetcars - and in a few short years, automobiles. Development continued south along the Licking River, with the estates of Robert Wallace and Eugene Levassor. Eventually, these estates were developed into upscale neighborhoods, now known as Wallace Woods and Levassor Park, which were on the streetcar line. Daniel Holmes also built an English-Gothic castle estate in this area in 1867, which became the Covington High School between 1915 and 1936. Holmes High School Campus continues to occupy the estate grounds. Peaselburg was a neighborhood just west of Wallace Woods across the railroad tracks. It was a German, working class neighborhood which incorporated as an independent municipality in 1880 under the name Central Covington. In 1894, Wallace Woods was annexed by Central Covington. Central Covington was eventually annexed by the City of Covington in 1907. In 1913, St. Augustine Catholic Church was constructed on 19th Street and became the neighborhood's focal point. In 1909, Covington annexed Latonia and Rosedale, two neighborhoods to the south of Wallace Woods, between the Banklick Creek and the Licking River. West of downtown Covington, along the Ohio River, developed the city of West Covington, which is now known as Botany Hills. Covington annexed the city in 1916. Stewart Iron Work Company was a major employer of over 600 employees until 1915, and Bavarian Brewery was also a large employer until Prohibition in 1918. The height of Covington's influence was in the 1920s and 30s. The city bustled with its mixed-use development of living, eating, commerce, and recreation, which created walkable communities and communities that were just a short ride on the streetcar. Frederick M. Jones was an African American inventor born in Covington, who in 1935, invented the refrigeration equipment for trucks, which dramatically altered the shipping and food industries. Railroads and ships eventually utilized his product, as well. He also invented a movie projector that could play movies with sound. During the 1950s, Covington annexed 100 more acres in Lewisburg and Latonia. Annexations in the 60s establish the current boundaries of the city: land that is now the Monte Casino neighborhood, land near Kyles Lane, land near Devou Park in Kenton Hills, and a large, 4,000 acre-tract of land south of Latonia, which is now known as South Covington. With Post-World War II urban flight to the suburbs, population began to decline, and this continued through the early 1980s. Following this time, developers and investors were attracted to the city once more, much like the city's founders. Today Covington's population and commercial heartbeat is showing a steady increase and revival.